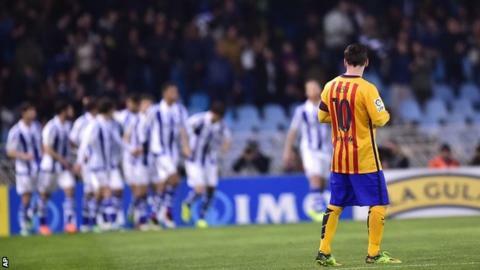 Barcelona continued their poor form at Real Sociedad as they suffered a shock loss to blow open La Liga title race. After Atletico and Real Madrid both won earlier on Saturday, Barca now hold a three-point lead over second-placed Atletico with six games remaining. They have collected only one point of a possible nine and were soundly beaten by Sociedad, who went ahead through Mikel Oyarzabal's early header. The hosts defended superbly with Lionel Messi wasting a hat-trick of chances. Arda Turan was also foiled by brilliant Sociedad goalkeeper Geronimo Rulli as they hung on against a Barca team missing the suspended top scorer Luis Suarez. The result means that Barca have lost five and drawn one of their last five visits to the San Sebastian side. Their last win there was in 2007. With Luis Suarez banned, Messi was left with added responsibility to prise open the Sociedad defence but he could not find the telling blow which would have taken him to 500 goals for club and country. After smashing over in the first half and then seeing Rulli save his close-range header and a right-footed toe poke, Messi has now failed to score in 362 minutes in all competitions, his leanest spell since 2011. But Barcelona, who made four unenforced changes to the team that beat Atletico in the Champions League last Tuesday, were lacklustre all over the pitch. Following their El Clasico defeat last Saturday, Luis Enrique's side were pressed emphatically during the first half by Sociedad, who are coached by former Barcelona B boss Eusebio. And although the hosts tired in the second half as Andres Iniesta, Jordi Alba and Ivan Rakitic were all introduced, they defended in numbers on the edge of the box to keep out the defending champions. Barcelona now travel face Atletico Madrid in the second leg of the Champions League quarter-final on Wednesday but with an away goal against them after winning 2-1 at the Nou Camp. They then face six games to win the title. Three of those games are at home - against Valencia, Sporting Gijon and Espanyol, while the away games are at Real Betis, Deportivo La Coruna, Granada. Match ends, Real Sociedad 1, Barcelona 0. Second Half ends, Real Sociedad 1, Barcelona 0. Gerard Piqué (Barcelona) is shown the yellow card. (Real Sociedad) wins a free kick in the defensive half. Attempt saved. Andrés Iniesta (Barcelona) left footed shot from the centre of the box is saved in the centre of the goal. Assisted by Jordi Alba. Offside, Barcelona. Lionel Messi tries a through ball, but Gerard Piqué is caught offside. Corner, Real Sociedad. Conceded by Javier Mascherano. Corner, Barcelona. Conceded by Xabi Prieto. Substitution, Real Sociedad. Héctor replaces Mikel Oyarzabal. Attempt saved. Lionel Messi (Barcelona) header from the centre of the box is saved in the centre of the goal. Assisted by Dani Alves. Attempt missed. Mikel Oyarzabal (Real Sociedad) left footed shot from outside the box misses to the right following a corner. Corner, Real Sociedad. Conceded by Andrés Iniesta. Corner, Real Sociedad. Conceded by Gerard Piqué. Attempt blocked. Lionel Messi (Barcelona) left footed shot from outside the box is blocked. Assisted by Ivan Rakitic. Substitution, Real Sociedad. Zaldúa replaces Aritz Elustondo. Ivan Rakitic (Barcelona) wins a free kick in the attacking half. Corner, Barcelona. Conceded by Alberto De la Bella. Attempt saved. Lionel Messi (Barcelona) left footed shot from the centre of the box is saved in the bottom right corner. Assisted by Gerard Piqué. Corner, Barcelona. Conceded by Aritz Elustondo. Foul by Carlos Vela (Real Sociedad). Substitution, Barcelona. Ivan Rakitic replaces Sergi Roberto. Javier Mascherano (Barcelona) is shown the yellow card. Neymar (Barcelona) wins a free kick on the left wing.